Jeju Aerospace Museum (JAM), the115 billion won Jeju Free International City Development project that took three years to complete, is the largest aerospace museum in Asia. The grand opening was on April 24. It has a total floor area of aproximately 30,000 square meters. The museum is located in the Andeok-myeon area of Seogwipo city, and adds to Jeju Island’s already rich seletion of museums and tourist attractions. The first floor of the museum is the aviation section. 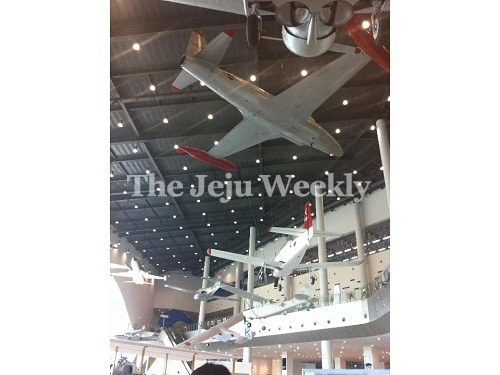 Here the different galleries explore the history of the Korean Air Force (KAF) and world aviation. Impressive displays include a selection of planes donated by the KAF and informative sections about aviation science and technology. Moving across the floor visitors encounter flight simulators and presentations that detail the design and function of plane and engine parts. The second floor contains the astronomy space studio; This includes the five of theaters Polaris, Orion, Canophs, Procyon, Arias. Here the visitors can get lots of information about spsce and astronomy. Lim Hyun-Su, a 46 year old man who lives in Seogwipo City, initial thoughts of JAM was that it was big and grand. Another visitor was Jo In-Hwan, a 45 years old man who lives in Seoul. His first impression was that JAM was large and clean. A 5-year-old boy named Seo Won-Jun had a mother who said it was marvelous for her son to see the rockets. The JAM museum is opened from 9:00 a.m~6:00 p.m during the week, and Sundays. Every Saturday, as well as between the dates of June 20th~August 31 2014, JAM is open from 9:00 a.m~9:00 p.m. The admission fees are 11,000won for Children(3~12 years old), 13,000won for teenagers (13~18 years old), and 15,500 won for adult. The JAM is closed every first and third Monday. You can call 064-800-2000 for more information.